A massive thank you to all the lovely stallholders and customers who came to the Handmade, Vintage & Gift Shopping Event in Raunds on Saturday. We had 25 handmade stalls in the larger hall and 15 vintage and gift stalls in the smaller hall as well as refreshments and yummy cakes! 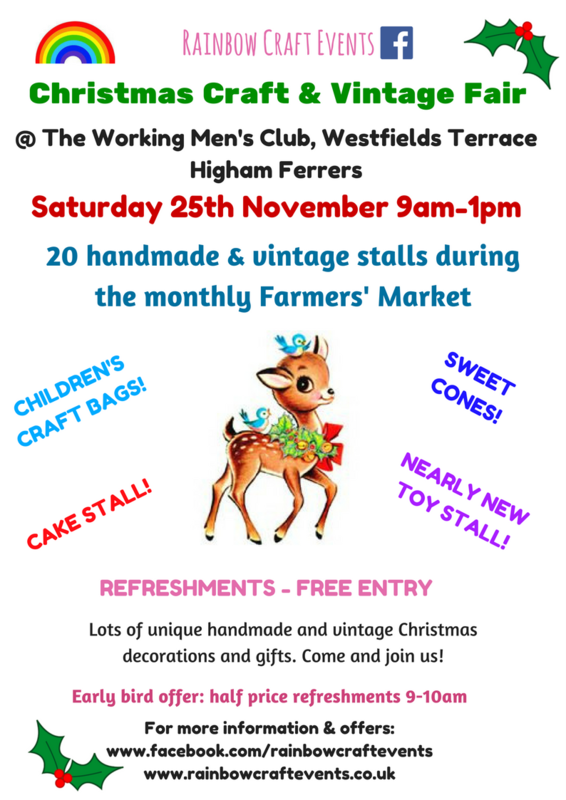 Stalls included vintage jewellery and Christmas decorations, cards, wax melts, both handmade and Scentsy, Forever Living, fabric gifts, vintage inspired crochet, knitted items, charity stall, patchwork, printed illustrations, sand art plus plenty more! As it’s been a year since Rainbow Craft Events first started Dawn had made a fantastic birthday cake as well which was delicious! Jamie took some great photos of local families too which went down really well. Feedback from stallholders was positive and many said they had had a successful day which I am always pleased to hear! For me, I would’ve preferred higher footfall. I always advertise like mad and spent some time on Saturday walking up and down the High Street giving out flyers but there were hardly any people on the High Street to give them to. The ones I did see tended to already be on their way up to the hall. There was always a steady flow of people walking round the hall and most had bags full of things they had bought which is great. We certainly got through a lot of tea and coffee and I sold plenty of craft bags! On December 3rd 1-3pm we will be holding a Nearly New Sale and Craft Fair at Saxon Hall. There are still spaces in the NNS room so if you would like to book at able please send me an email to rainbowcraftevents@Yahoo.co.uk Stalls are £8 and include a free hot drink, bottle of water and cereal bar. It really was a fabulous event at the Stanwick Christmas Craft Fair! Thank you so much to all who attended the craft fair on Sunday 22nd November at Stanwick Village Hall. It was lovely to meet so many fantastic stallholders and customers, all of whom I really hope enjoyed the day and will be back for more Rainbow Craft Events in 2016! The feedback I received was overwhelmingly positive and any constructive comments were useful in helping me make the craft fairs at Stanwick and The Mandeville Hall, Kimbolton as successful as possible next year. Lots of people commented on the high quality of the items for sale and what a lovely range there was. There were many cups of tea (and even more hot chocolate!) enjoyed with a delicious cake and it was great to see little ones using the highchairs and playing with the toys and books provided too. I’m still really keen to hear what people thought of this event so if you have any feedback I would love to hear it – please do get in touch!